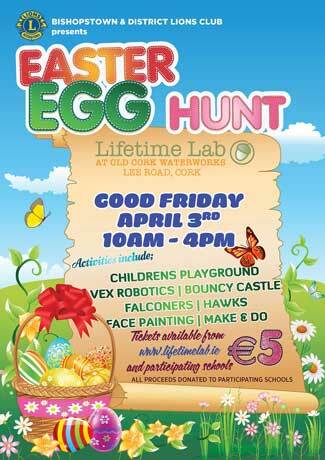 Lifetime Lab in association with Bishopstown and District Lions have a great day organised to get the Easter weekend started. On April 3rd,Good Friday a host of activities including face painting, make and do,balloon making, falconry and magic shows are on offer all centered around an eggciting Easter Egg Challenge. All completed easter egg quiz cards will receive a prize and proceeds from the event will be distributed to local primary schools in the Bishopstown area.